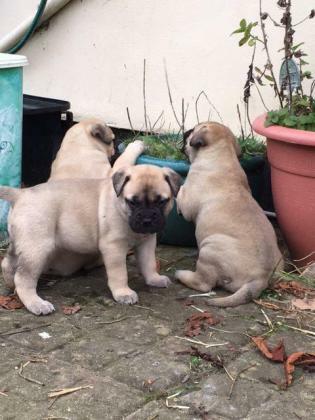 Stunning Bullmastiff Puppies For Sale. Red with black mask. Puppies are well socialised with other dogs, adults and children. They are used to the sights, sounds and movements of a busy family home. Both parents have great temperaments. Puppies are wormed to date, has had their 1st and 2nd injection, microchipped and has passed a full health check by our vet. They will leaves us with a puppy pack containing food, toy, treats, and a blanket with their mothers scent to help them settle the first few nights. Kind, loving home only.